Tyr’s role as one of the principal war gods of the Norse, along with Odin and Thor, is well-attested in sources from the Viking Age and earlier. For example, in the Sigrdrífumál, one of the poems in the Poetic Edda, the valkyrie Sigrdrifa instructs the human hero Sigurd to invoke Tyr for victory in battle. Another Eddic poem, the Lokasenna, corroborates this picture by having Loki insult Tyr by saying that he could only stir people to strife, and could never reconcile them. But Tyr is far from only a war god. In fact, his primary role seems to be that of an upholder of law and justice. Those Roman inscriptions to him as “Mars,” for example, sometimes invoke him as Mars Thincsus – that is, Mars of the Þing, the ancient Germanic legal assembly. 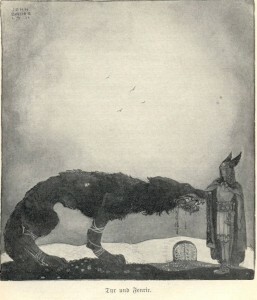 But the most compelling evidence for Tyr’s role as divine jurist – and a heroic one at that – comes from the tale of The Binding of Fenrir, the only surviving myth to feature Tyr prominently. The dreadful wolf Fenrir was only a pup, but he was growing quickly. The gods feared for their lives, so they endeavored to tie up Fenrir in fetters from which he couldn’t escape. When Fenrir laid eyes on the chain that would eventually bind him, he was suspicious, and declared that he would only allow the gods to put it around him if one of them would stick an arm in his mouth as a pledge of good faith. Only Tyr was willing to do so. When the wolf found himself unable to break free, he bit off Tyr’s arm. In the words of the esteemed scholar of comparative religion Georges Dumézil, Tyr, “with his sacrifice… not only procures the salvation of the gods but also regularizes it: he renders legal that which, without him, would have been pure fraud.” In the same way that Odin showed himself to be the foremost god of wisdom by sacrificing one of his eyes in its pursuit, so Tyr showed himself to be the foremost god of law by sacrificing one of his arms to uphold it. The disfigurements of both gods are parallel, and demonstrate something essential about their characters. But why would the foremost god of law and justice also be one of the principal war gods? Isn’t there a tension here between two realms of life that are either unrelated or even antithetical to each other? It should be noted that, from the Germanic point of view, there is no contradiction between the concepts ‘god of War’ and ‘god of Law.’ War is in fact not only the bloody mingling of combat, but no less a decision obtained between the two combatants and secured by precise rules of law. That is why the day and place of battle are frequently fixed in advance… So is explained, also, how combat between two armies can be replaced by a legal duel, in which the gods grant victory to the party whose right they recognize. Words like Schwertding [“the meeting of swords,” a kenning for battle], or Old Norse vápndómr [“judgment of arms”] are not poetic figures, but correspond exactly to ancient practice. Furthermore, the law could be used to gain victory over an opponent just like war could, which made the legal assembly a metaphorical battle. The Norse/Germanic war gods can be distinguished by – among other things – the fact that each are connected to a particular aspect of war. Thor, for example, is involved in the brute physical combat; Odin in the magical and psychological forces at work; and Tyr in the legal decisions and principles of justice surrounding war. Both the name *Dyeus and the basic Proto-Indo-European word for “god,” *deiwós, are variations of the root *dyeu-, “the daytime sky.” *Dyeus was the quintessential “Sky Father” and likely one of the chief deities of the Proto-Indo-European pantheon. After all, his name was effectively identical with the word for godhood itself. Other gods derived from him include the Greek Zeus and the Roman Jupiter (from *Dyeus Phater, “Sky Father”). Fascinatingly, the modern English words “day” and “deity” both come from this same root. As with Tyr, one of *Dyeus‘s roles was that of a guarantor of justice, one before whom oaths were sworn. While there’s little to nothing in the Germanic sources that specifically links Tyr to the daytime sky, a tantalizing clue that such a connection may once have existed comes from the shape and name of the rune used to write the letter “T.” The runes’ shapes and names were thought to symbolize particular cosmic forces. The T-rune’s name was “Tyr” (or, in earlier times, *Tiwaz, Tyr’s older name). The rune has the shape of an arrow, which is probably connected to Tyr’s role as a war god. But the arrow is pointing upward, as if toward the sky. Could this indicate a now-forgotten role for Tyr as a sky god, in the same manner as *Dyeus? In any case, it’s clear that Tyr’s humble place in recorded Viking Age mythology hardly reflects the high esteem in which he was once held. Indeed, at one point, he, or at least his predecessor, was as indispensable as daylight in the minds and hearts of his worshipers.